Some sources reported that a “90-year-old man was arrested for feeding the homeless.” This set off typical fact-free indignation on the social media and talk shows, not to mention the angry e-mails from around the world: Charity illegal??? A kind old man arrested just for trying to help the poor! Cruelty!!! ARGGGHHH!!! Naturally, this was not what really happened. For 23 years, since he was 67, 90–year-old Arnold Abbott and his non-profit organization, Love Thy Neighbor, have provided food for the homeless at a public beach in Fort Lauderdale, Florida on Wednesday of every week at 5:30 p.m. This year, on October 21, the City of Fort Lauderdale Commission passed an ordinance that banned such food distributions in public. The ordinance required that organizations distributing food outdoors would have to provide portable toilets for use by workers and those being fed. It’s a health and safety regulation, for the benefit of homeless and vulerable. A few days after the ordinance took effect, on a Wednesday, at a bit after 5:30 PM, Abbott was approached by police officers and cited for violating the ordinance. He was not arrested. He was told that he must appear in court. After Fort Lauderdale Mayor Jack Seiler was called everything from a monster to a Republican (he’s a Democrat), someone finally asked him what the ordinance was all about and questioned his police department’s treatment of the kindly senior. “We hope he feeds, ” Seilor said. “He has a very valuable role in the community. All we’re saying is he can feed the next block over. He can feed at the church. We want them to be in safe secure settings. We wanted them to be in a sanitary matter. We them to have facilities available before and after.” That seems reasonable. Seiler has also offered an explanation for the ordinance, which was backed by the Chamber of Commerce, that sounds more, well, Republican, saying that providing the homeless food in public only enables homelessness, and that Fort Lauderdale wants the homeless to use government and church services. “If you are going to simply feed them outdoors to get them from breakfast to lunch to dinner, all you are doing is enabling the cycle of homelessness,” Seiler says. Well, that’s debatable, but it isn’t unreasonable. Still, it’s hard to teach old humanitarians new tricks, and Arnold is defiant. “I don’t plan to give up the beach,” he told reporters. He’s going to challenge the citation, and could spend up to 60 days in jail and have to pay a $500 fine. Since the initial charge, he’s been cited multiple times. This fight isn’t new: Abbott sued the City of Fort Lauderdale in 1999 when it tried to stop him from feeding the homeless on a public beach. Abbott won the case three times in circuit court and twice in the court of appeals. But there was no ordinance then. 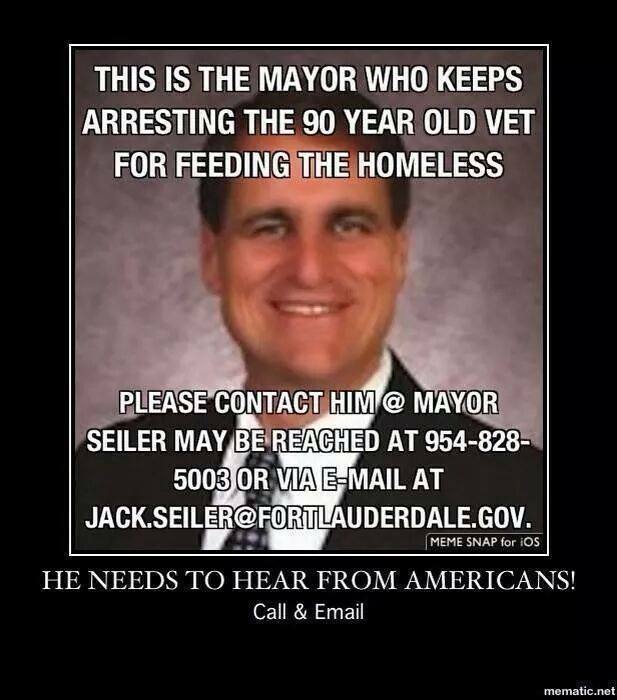 Who is wrong here: the 90-year-old humanitarian for defying the law, or the City of Fort Lauderdale for charging a kind old man for feeding the hungry? That’s my answer. One can argue about the wisdom of the law, but that’s irrelevant. It’s also irrelevant that Arnold is 90, and that he’s been doing this for a long time. What should the city do, have a special dispensation that allows really old people to break laws if they disagree with them? Should it just let Arnold do whatever he wants, and enforce the law against everyone else? Or should Arnold be allowed to veto the law all by himself, because he knows best? Few laws work perfectly, and this is a perfect example. If all efforts to feed the homeless were performed as responsibly and reliably as Arnold’s no such ordinance would be necessary (assuming that one is necessary). Laws have to apply to everyone, however. Arnold is s sympathetic figure, and he’s playing the media like a Stradivarius, but essentially he’s using his age as an excuse to violate the law. He’s the one in the wrong here. I read about that. I guess charity is now to be a wholly government run enterprise. Except the mayor specifically referred to a “Church” run charity one block over. I asked my husband (a retired police Sergeant for the City of Hollywood, FL – the next town over – who spearheaded their Homeless Intervention Unit and I knew would be empathetic to Arnold’s efforts) what he thought. His answer? “You can’t set up shop wherever you feel like it”. A man of many words, my husband. I guess that’s why lemonade stands are now politically incorrect. My kids’ stands were always on our front lawn or our driveway. Private property. What’s politically incorrect about a lemonade stand? They seem to be the target in certain places in Florida, Alicia. What I really don’t understand is how “setting up shop” was even relevant in the case of the 90 year old gentleman. What I would like to know — why does Mr. Abbott feel that it is important to have the beach location? I haven’t noticed any mention of this in any of the news sources where I’ve read about this situation. Maybe he has a good reason — maybe he doesn’t. This seems like a simple way to begin The Conversation down there in FL FL, rather than maintaining an adversarial confrontation. I assume its just that this is where he has always done it. Jack is right on point here. While it is noble to want to feed the hungry it stands to reason that government officials will need to regulate such activities the same as for profit restaurants. The purpose is public safety. Imagine if Mr. Abbott had decided that the local public school or government office building was his venue of choice. It seems to me that that would interfere with the public purpose of the social asset. Furthermore, without proper sanitary facilities it is quite probable that public urination and defecation will soil the public beach or adjacent areas. Moreover, if we want to protect the homeless, it seems to me that providing food without health department oversight could be reasonably expected to result in someone contracting food poisoning which will result in harm to the homeless and health care costs to the taxpayer when treatment is needed. Mass feedings are a far cry from some kid’s lemonade stand. Often the public uses the claim “if we can save just one child” then that justifies government intrusion in establishing regulations. I find it amusing that those that seek to promote this humanitarian effort fail to use the same argument here as they do when it comes to gun control. Do they fail to see that the risk to the homeless from potential food poisoning or the public at large from potential accidental contact with human waste could jeopardize lives? Or, does the benefit of feeding them outweigh the risk associated with the activity? Mr. Abbott has choices. He has not been denied the right to be a humanitarian; he must only perform his work in accordance with public policy. Total agreement. It may…or may not…be a good law, but it is the law. Disobey it at your peril. Mr. Abbott is indulging in civil disobedience. He disobeys the law, and he knows that he is disobeying a law with which he disagrees. He doesn’t become violent (at least I think he doesn’t), and seems willing to fight it in court. It’s really simple. The ranting against the mayor is stupid and futile. What people find objectionable is the law. And to Jack, Abbott’s insistence about the beach location makes me think that there is a reason behind it, not just that this is the place he’s always done it. Why doesn’t somebody ask him? Patrice…I was wondering about Abbot’s insistence about the beach location also. The only thing I could find was that Abbot said that the beach was a beautiful location and that the homeless could take in the scenery just as equally as the next person in that location. From what I have gathered, Abbot seems to feel that the city is overstating it’s resources for homeless people. He might be concerned that there will be no private properties within that area which will be willing to let his organization use it’s facilities to feed the homeless. Recently, it seems that a near by church did volunteer to allow him to use their facilities and Abbot used those facilities and it seems that the city was happy about that…although Abbott said that he was not finished fighting and will be back on the beach next week or the near future. That was the jist of the article. I think that as long as Abbott has facilities near him that are willing to allow him to feed the homeless legally, I’m not sure that scenery is going to be a great legal justification to break the law. I think that if he is forced to use the beach area or any other public space because there are no facilities in the area which will allow him to use their facilities, that might be a different issue. Abbot has won several court cases up to this point regarding allowing him to use the beach and the city not wanting him to use the beach so I wonder what the merits were in those cases? My thoughts exactly. This should at least push for revising the law as written. I wonder if there is a bit that city leaders don’t want homeless on the tourist beaches. Homeless don’t always have the transportation to go where facilities are and they might be living on or near the beach too. I think there are aspects the press should be goign on about instead of just his age or tradition. The Religious Freedom Restoration Act – which over-rides both state and city law – states that any ordnance of this kind must not only be justifiable on public policy grounds, but must be the minimum required. The first is debatable – the second manifestly not the case. The city itself could provide the facilities needed. See Hobby Lobby and the fruits thereof. Personally I think the RFRA is overbroad the way the SCOTUS has interpreted it, but the Law is the Law. If we’re going to play by those rules. The freedom of religion restoration act only applies to acts of Congress. City ordinances would be governed by provisions of the state constitution or relevant law.